It’s hard to miss Stephanie Imbeau’s “Rain Cloud (Wall Cloud, Baltimore)” the moment you enter School 33’s main gallery. The sculpture looks like a rainbow-colored parasol parade, kinda like the one seen in the title sequence of Jacques Demy’s The Umbrellas of Cherbourg, that caterpillar-crawled across the wall, slinky flipped toward the floor, and sprang up to the ceiling. And at first encounter it’s difficult to wrap the brain around, at first glance recalling the instant smile provoked by Franz West’s “The Ego and the Id” that was created for the Baltimore Museum of Art’s To Build a House You Start With the Roof retrospective in 2008. This insouciant vibe is a nice calibration for taking in Move, Maneuver. Track And Traipse, the group show curated by Karyn Miller, the director of exhibitions at the Arlington Arts Center. The work here is sneaky plunge into the metaphysical. The four artists—Sonja Hinrichsen, Imbeau, Hiroshi Jacobs, and Alessandra Torres—take different approaches to navigating and inhabiting physical space. The work feels strangely novel, as if artists focusing on the IRL realm is some kind of throwback. Imbeau, Jacobs, Torres, and curator Miller talk about the work and exhibition at a panel discussion at School 33, May 30, at 2 p.m.
Jacobs’ “Inside/Out” embraces the conceptual divide packed into that “IRL” shorthand used to separate directly observed space from the virtual. The installation engulfs the smaller gallery off the main room, and it completely hijacks the space’s geometry. Imagine two king-sized platform bed frames, wrapped in lavender stretch fabric, that have been distorted from ordinary rectangles into irregular polygons, one shoved flush into the corner of the room on the floor, the other acting like a drop-ceiling from above. Resting on the lower one shape is another geometric hunk of something or other, like a dodecahedron after an extreme makeover. The room is kept at low light, and entering it feels like walking into the next generation Star Trek‘s holodeck as it’s in the process of rendering that cartoon-inspired house in the Joe Dante-directed segment of Twilight Zone: The Movie, a place where cotton-candy colors and skewed perspectives were visually menacing. Jacobs describes the installation as what the “act of finger-pinch zooming on your phone would look like as a physical space” on his web site, which highlights why the piece feels so uncomfortably banal. It’s an attempt at translating the trivial action on a digital interface into three dimensions, where we don’t have too many visual referents for it outside, say, the aforementioned sci-fi and speculative fiction comparisons above. Torres’ “Continuous Movement: Instructional Dance Machine, Prototype #2” shares that sense of the familiar unfamiliarity. The piece is a pair of curved steel rods elevated to human torso height; two black silk fans are attached to the curved rods, around which they appear to be able to move. A nearby set of photographs shows Torres demonstrating how the machine functions on a different prototype, the fans moved along the rods by hand. The motion draws arcs along which hands and arms might move while dancing, though the metal guides—the machine—defines the space in which the choreography takes place. During her three year residency at the Creative Alliance at the Patterson Theater, Torres experimented with a variety of performances and sculptures that examined how the body and/or objects occupy space. And the notion of a “dance machine” as an apparatus for occupying space is droll; Torres’ sculpture isn’t a game machine like Dance Dance Revolution; it’s a physical corral, a way of restricting movement. Dance is one of many ways exploring space corporeally, as temporally fugitive as music but tactile and visible. Torres’ three wall-mounted fans from her “Bomba Y Plena” installation make ephemeral dance architectural, disrupting movement around the walls where they’re installed. That they’re about waist-high and evoke the sight of a dancer’s twirling skirt cheekily freezes a visual memory that flits by in the briefest of moments. Hinrichsen’s “Snow Drawings – Eychauda France” digital prints treat time’s slipperiness in a more calmly reflective way. For her snow drawings project Hinrichsen uses snowshoes to walk crop-circle like connected swirls into the landscape. Scale is provided in the photos by houses, ski lifts, and clusters of trees; Hinrichsen is covering large, what look like football-field sized parcels of land. The photos are gorgeously serene: bright white surfaces with delightful curlicues carved into them. The longer you look, though, the more you realize how fleeting the sight you’re drinking in is. The labor involved is considerable—she’s visualizing the path taken by one human—and nature itself probably deleted the scene shortly after the image was documented. Hinrichsen’s photos become quietly profound memento mori, visual evidence of something that once was but now isn’t. These particular reminders of the physical world’s transience are achieved through a build up of the artist’s physical movement through time and space. 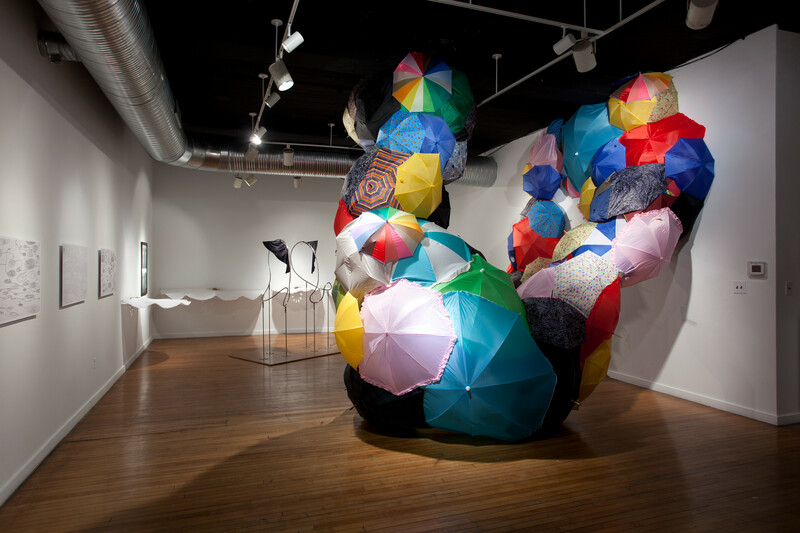 With accumulation in mind, take another look at Imbeau’s irreverent “Rain Cloud (Wall Cloud, Baltimore).” The Brooklyn-based artist has been using lost and found umbrellas to make her rain cloud sculpture/installations for a number of years now, and the bric-a-brac qualities of the materials gives the them an improvisational verve. But just look at all those umbrellas. How many are forgotten in a closet right now, or tossed underneath a car seat, or stashed behind an office door? How many are necessity purchases while on the go and then immediately forgotten? Where are they all made? Where do they all eventually end up? Such questions causes the brain to rifle through consciousness’ card catalog looking for something to compare “Rain Cloud (Wall Cloud, Baltimore)” outside the pun suggested by the title; mine settled on the nests of birds and insects who construct homes on the sheer faces of cliffs and buildings with scrounged materials, the improvised housing of shantytowns, the dumpster-dived dwellings of transitional populations. One human’s hoarding could be another’s home. Patiently, Imbeau’s work quietly evolved in the brain, and this ridiculous eruption of color and shape that assault the eyes transform into something more familiar, more deliberate, and more human.